Many young (and not so young) saxophonists wonder why their instrument is not a permanent member of the symphony orchestra. They point to its popularity in contemporary classical music and hope for a day when the saxophone will take its rightful seat in the orchestra alongside the other woodwinds. Some, perhaps, secretly dream of occupying a full-time chair as an orchestral saxophonist. While the saxophone may never, unfortunately, take a permanent place in the orchestra, it is being used more and more thanks to new repertoire and new audiences demanding variety and originality in programming. These gigs are rare and no one can expect to earn their living from them. However, the thrill of performing in an orchestra as a saxophonist is hard to match. This author has performed with six professional orchestras, and is currently Principal Saxophonist of the Wichita Falls Symphony Orchestra in Texas. While all musicians’ experiences are different, the below are thoughts gathered from my professional encounters over many years. While being the best classical saxophonist you can possibly be with a beautiful sound, pristine technique, and flawless intonation is essential, it is not enough to be prepared for all possible orchestral gigs. A versatile saxophonist must be comfortable with both classical and jazz styles. Many orchestral gigs will actually draw more heavily on the popular associations of the saxophone. Concerts with pop and country stars and holiday concerts will utilize a big-band style section of five saxophones. These consistent money-makers will often appear on a regional orchestra’s schedule far more often than any piece of classical repertoire utilizing saxophone. Another consideration is doubling. Many orchestral saxophone parts (whether in the repertoire or for pops concerts) require some amount, especially on clarinet. It is always a wise idea to have those skills as a saxophonist, anyway. Both inside and outside the orchestral world, being a proficient doubler will yield a great many more opportunities to play for money. An orchestral gig for a saxophonist often takes two very different forms: In the pops gig, you are often a part of a section, playing mostly in a hybrid classical/jazz style (sometimes known as the ”Manhattan sound”) or in an unabashedly jazz style. For pieces of standard classical repertoire, the scenario is very different. Most classical pieces commonly programmed by orchestras utilizing the saxophone were written for one performer: Ravel’s orchestration of Mussorgsky’s Pictures at an Exhibition, Bizet’s L’Arlesienne suites, Bernstein’s Symphonic Dances from West Side Story, and Prokofiev’s Romeo and Juliet come to mind. Rarer is the piece that calls for two saxophonists, such as Ravel’s Bolero (which is often performed with one saxophonist making a quick switch between soprano and tenor). Rarer still is the repertoire utilizing three or more saxophones. A notable, often-programmed example of this is Gershwin’s An American in Paris. There are common concerns and strategies to consider in all of these scenarios. The first is the issue of time. More than likely, the saxophonist will have plenty of it on their hands in both rehearsal and performance, as, at most, there may be one or two pieces on an expansive program on which the instrument is used. That is a lot of down-time. How should it be managed both from a playing and professionalism point of view? First, to the matter of professionalism: Unless otherwise indicated, the saxophonist should attend the whole rehearsal, and, of course, the whole concert. In some ensembles, the conductor prefers the saxophonist on-stage until the piece is rehearsed. If that is the case, the saxophonist should try to look engaged, rather than getting lost on their phone. If the orchestra is playing other interesting repertoire, perhaps bring a few scores to follow along with the rest of the rehearsal. It will keep you focused on the task at hand, and will often be a very instructive musical experience. If allowed to wait off-stage until the piece is called, don’t be afraid to bring reading material, but stay alert and be ready to go at short notice, as orchestral rehearsals move very quickly. 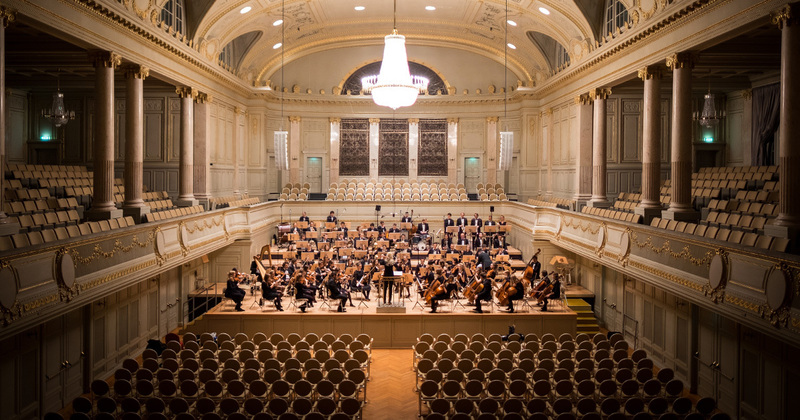 In musical terms, waiting should be considered in preparing for a performance with orchestra. Often, a saxophonist will have to wait on-stage for many minutes before playing their first note. In pieces like Pictures at an Exhibition, the solo (the only time in the piece that the saxophonist plays at all), comes approximately five minutes into the piece, and there are an additional twenty-five minutes of music after the solo. Some psychological preparation is in order for that sort of situation. Also, of course, the saxophonist should have a plan for insuring that the reed is moist and ready to make a beautiful sound after a wait, and they should be prepared to sit for a considerable amount of time after the solo, looking poised and professional. Another consideration when performing with an orchestra is that the conductor is the final arbiter of the musical product. Many musical directors will allow the saxophonist to play unhindered. Many others will walk into a rehearsal with a definite idea of how they would like the saxophonist to play. In those situations, it is the musician’s responsibility to fulfill the intent of the conductor. It may behoove the saxophonist to listen to several different recordings of the work in question performed by great orchestras to have several different interpretive possibilities available to them. Those recordings by the Chicago Symphony using Fred Hemke, the Berlin Symphony using Daniel Deffayet, or the Detroit Symphony using Larry Teal or Donald Sinta are especially instructive and useful. Look to modern recordings (especially on YouTube) of Timothy McAllister with the Los Angeles, Chicago, and Detroit Symphonies, and Joseph Lulloff with the Cleveland Orchestra as further great examples of orchestral saxophone-playing. Keeping with the above thought, the orchestral saxophonist should be flexible in their approach, and should have many different possible interpretations, in the event that the conductor desires something different. The orchestral saxophonist should perform on a setup that allows for the widest variety of tone colors and timbral possibilities. This author has personally found Optimum mouthpieces to be the best possible tool for orchestral playing: The basic tone color blends well with the other woodwinds, while there is great flexibility to brighten and darken the sound depending on the style called for. The saxophonist can easily create a dark, rich sound for Mussorgsky or a slightly lighter, brighter sound for Bernstein’s Symphonic Dances from Westside Story. Most saxophonists have grown up in wind bands. While there is a wealth of wonderful literature and great tradition attached to these ensembles, it is a rare treat to perform in an orchestra, hearing the combined sounds of strings, winds, and percussion wash over you. To perform in an orchestra is to feel even more connected to the great history and literature of classical music. For all those who find the opportunity, enjoy it to the fullest!